ANN ARBOR, Mich. — Seventy-eight percent of parents in a national poll had a clear answer when asked how they would react if their own teen wanted a tattoo: absolutely not. However, another 1 in 10 parents thought a tattoo would be OK as a reward, to mark a special occasion or if the tattoo could be hidden. And many parents have already faced these types of conversations, with a quarter saying their teen has asked about a tattoo, according to the C.S. Mott Children's Hospital National Poll on Children's Health at the University of Michigan. Topping the list of parental concerns about tattoos: impact on health, social acceptance and their child's professional career. Roughly half of parents said they were very concerned about negative health effects, such as infection, scarring or transmission of diseases, such as hepatitis or HIV, through unsanitary needles. 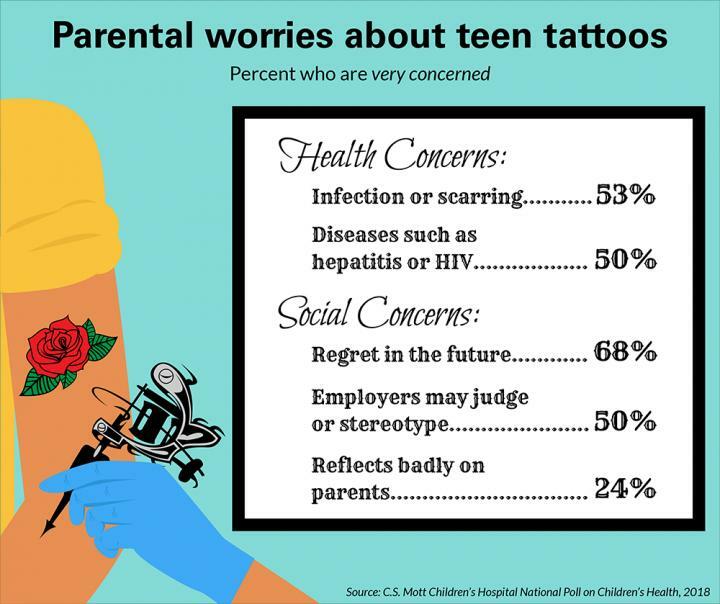 Half of parents were also very concerned that employers might judge or stereotype their teen unfavorably if they had a tattoo, while 24 percent were very concerned that a tattoo would reflect badly on the parents themselves. The most common concern (among 68 percent of parents): future regret. "As tattoos become increasingly popular across all age groups, more parents are navigating discussions about tattoos with their children," says poll co-director and Mott pediatrician Gary Freed, M.D. M.P.H. "Many parents agree that tattoos are a form of self-expression but worry that teens may not consider potential health risks, how a tattoo may impact them professionally or the chance that as they age and mature, they may regret getting a permanent tattoo." The nationally representative report, which is based on responses from 1,018 parents with at least one child ages 13-18, suggests a substantial number of parents have already addressed the subject of tattoos. Twenty-seven percent of parents of teens ages 16-18, and 11 percent of parents of teens ages 13-15, said their teen had asked them for permission to get a tattoo. Five percent of parents indicated their teen had already gotten a tattoo, and 32 percent of parents had a tattoo themselves. Two-thirds of parents (63 percent) also said they considered tattoos a form of self-expression similar to dying hair or clothing choice. However, parents polled strongly supported state laws requiring parental consent for tattoos for children under 18 years old. A 2017 report by the American Academy of Pediatrics suggested tattoos and piercings among young people are becoming more mainstream and that pediatricians need to be prepared to discuss potential health risks with adolescents. The report cited a Pew Research Center study that said about 38 percent of young people ages 18 to 29 have at least one tattoo. "In addition to doing their own research and having conversations at home, parents may encourage their teens to talk to their doctor if they ask for a tattoo," Freed says. "While medical complications aren't common, it's important for young people to understand and consider all potential risks associated with body modifications like tattoos."